The Massassi Temple Review Site has just posted a new review of Infernal DM. The level was created by HothRebel. The Massassi Temple Review Site has just posted a new review of Jedi Tower. The level was created by Woody. The Massassi Temple Review Site has just posted a new review of Frigate Mayhem. The level was created by Xyn-Jian. You're probably asking yourself why we haven't been posting tons and tons of new levels lately, eh? Well, it's not because Kedri, Blujay, and I are completly lazy slobs (Well, that's not the whole reason, at least), it's because the posting script is down due to the new level section features! But don't fret, we'll be back to our 10 levels-a-day average soon enough. Until then, go comment on the pretty pictures in the showcase forum, or play with a shiny object. Yes, Gamespot has released a second part to its earlier preview of Obi-Wan. This promises to be just as good, or better, with a mission by mission description of the single player adventure. Looks hot, so pay this preview a visit. Big thanks to Jedi Legacy and Obi-Wan Kenobi.Net for the news. How could we miss this news? Shame on me! It seems that Zanardi has set up a lil' site called 3do Studio. What do they do? Well, they make 3do's for your projects. All you have to do is go and request a 3do! So go pay their all-too-funkily designed website here. I am very pleased to announce the release of Massassi's new levels section. The new section offers a couple of features that the old one didn't, including advanced sorting options and download counts. Due to the fact that a lot of the current data was yanked from plain HTML, you may find a few errors. If you do find errors, please let us know and we will fix them! I would like to thank jturcio, Darth_Mult and Kiramin for helping me out with converting the old levels. Together, we extracted descriptions and screenshots from almost 900 HTML files. Needless to say, I really appreciate their help with this. Along with the release of the new levels section, we have changed the level submission requirements. The change is that we now require two screenshots with each level. Frankly, people won't download your level without screenshots, so we're tired of wasting our time. Take pride in your work, make a killer level and submit two screenshots with it! Details can be found in the submission instructions. Hideki sends word that Millennium has been updated. This time they've got a new tutorial on making a flash grenade, a new release of Sniper Arena that's compatible with computers that don't have a 3d card, and the answers to the final cog quiz (it's closed for good). It seems that Gamespot has constructed an Obi-Wan Sneak Peek, which has tons of Obi screens. They have previews, a screenshot index, and they even have a slideshow. All you die-hard Obi-Wan fans, be sure to check this out. The Massassi Temple Review Site has just posted a new review of Deep Space Depot. 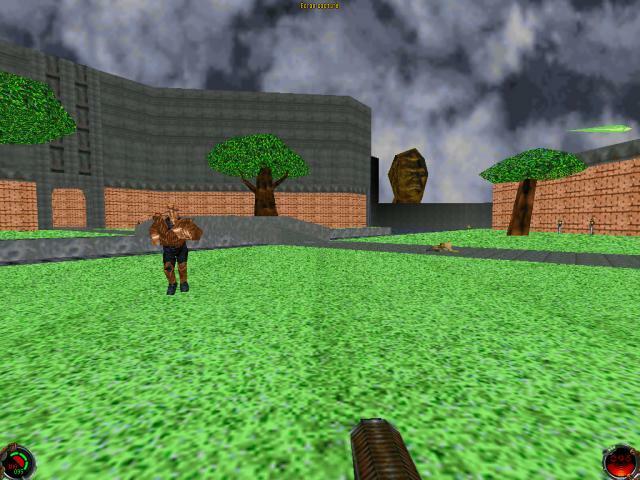 The level was created by Mike Kennedy (Vermifax). The Massassi Temple Review Site has just posted a new review of DC Oupost. 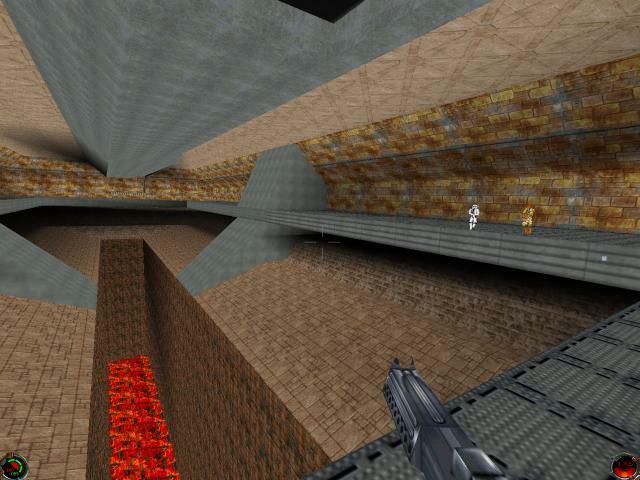 The level was created by Daniel Clausen(DC_Okieace). Description: This a Jedi Knight level that is best suited for 3 or more players. It is the IRG Imperial Palace on Coruscant. There are plenty of traps, and the level is massively huge. It seems that Zuljin has founded a new website, Tiny Textures Inc. What is this website's purpose? Well you should already know, but if you're blonde, like me, I'll tell you. This website is dedicated to making textures, helping you make textures with tutorials, and much, much more! The site is brand new, and Zuljin has also put up a banner and logo contest. This site is definitely worth a visit, so go pay Tiny Textures Inc a visit! It seems that Alliance Editing has released its second matpack. This pack includes 31 mats, most of them masterfully created by Zulijin and Posse. This pack is mainly dedicated to concrete based mats, as well as other mat types. They all promise to be swank, so head on over to Alliance Editing and get that pack! The Spawn TC News Site updated today with a new screenshots page and some screenshots of the revised Hell Multiplayer Level, as well as some general progress news. Check out the Spawn TC News Site today! Well, that pretty much sums it up. Take a peek at their news site, as well as their home page! Phew! After a week's worth of perl coding (blech), the Outpost Ubiqtorate (the file system) is complete. Do you want your file stored at the Ubiqtorate? Fill out our nifty submit form and we'll take care of the rest. There are plenty of viewing options available, so I'll prepare a quick help file later tonight or tomorrow morning. If you have any problems whatsoever with the Outpost Ubiqtorate, please contact me and I'll get right on it. This sounds like a very nifty idea, so head on over to Outpost D-34 and pay the Outpost Ubiqtorate a visit! A pack that consists of tools especially used for snipers. It includes a zoom scope, silencer and a laser pointer for a great sniping experience and a knife for some hottest close combats. Try to snipe one particular part of the body to give the victim various disadvantages. It should be noted that this pack was designed with 3D acceleration in mind, but the graphically challenged aren't exactly out of options, either. I haven't downloaded it out yet, but from what I've seen and been reading so far, this thing promises to be a lot of multiplayer fun! Check out his page to read more. Description: This is a medium-sized multiplayer level that is set at an abondoned cargo processing facility on the planet Teyr. It consists of an inside area, an outside canyon area, and even a hidden underground cavern. It can be played with both guns and sabers. The canyon area outside is best for saber fighting. Intended for 2-4 players. Description: A mod that's totally designed for you Pok�masters out there. It changes all the guns and forces to Pok�mon powers! Great for any level with any skin, recommend playing Pok�mon Stadium with the Pok�mon Skins, but either way it's very fun! Ranges from Psywave to Fire Blast to Splash! Hope you enjoy this as much as me and my friends do! Description: This patch will replace Kyle with a Wood Elf skin from the Games Workshop game Warhammer. The Wood Elf can flip, has his own wooden saber and also has some new sounds. Hideki sent word a few days ago about a new tutorial he posted over at his site, Millennium. The tutorial shows you how you can create a laser pointer for JK. Sure, they're annoying in real life, but I can think of a few very interesting applications of the idea in the game... Glancing at the main Tutorials Index, you'll see he's got quite a few of them he's working to post on the site, so be sure to check back every now and then for updates! Doing my morning rounds earlier I noticed BoBo Fett, over at Jedi Dreams, posted a new tutorial on creating rugged outdoor landscapes yesterday. Specifically, he demonstrates how it was done in a couple of his levels, Legends of the Force: Journey to the Zelaskata Mountains and F.O.E.. Interesting reading, as always! Description: The fate of humanity is at stake. This multiplayer level gets its name because you're in Canyon Oasis, only there is no sky; in other words, there is no way out. Resembling a bio dome type level, it has nothing but CONC RIFLES ALL OVER! You'll never run out of ammo. New sections, traps, and best of all, the lightning trap is disabled. Well, kind of; push it and see. It also has a waterfall for supporting life, unless of course you get shot. What will happen to humanity?! Description: A medium-sized level played with guns, sabers, Force or no Force. Suitable for a two player match, but it will be up to the host and the abilities of his/her computer to set the maximum number of players. I do hope you enjoy. Description: This is the latest version of Psycho. A couple more guns have been added. Description: This is the second version of my Taunt Mod that allows you to taunt other players in multiplayer. It has more features, a new BM and a new MP skin of Lt. Grant.